Frank Hinder's 'Tram kaleidoscope' captures the essence of Sydney modernism. It synthesises elements of Cubism, Futurism and Orphism to form an ambitious statement of the city as a dynamic, living organism. 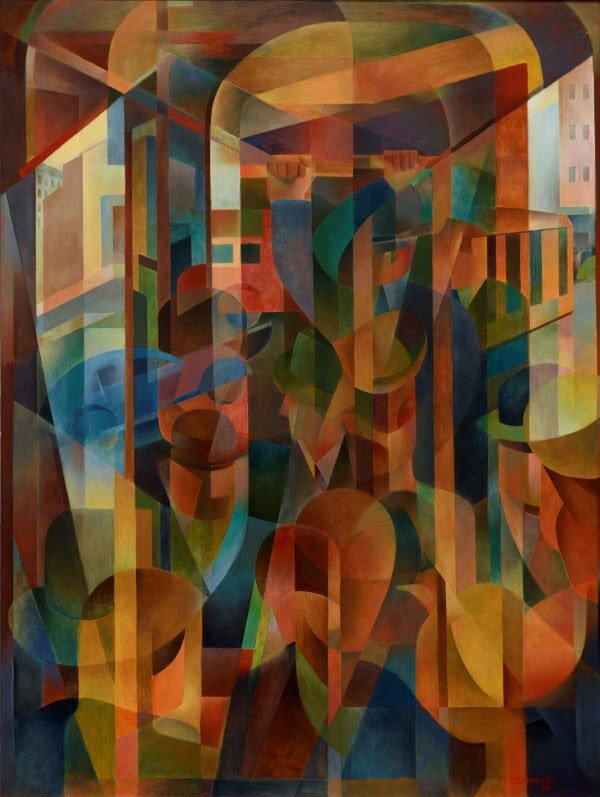 The painting is fragmented and presents simultaneous views of the tram and the outside street. Time and space are no longer linear and discreet, they have become intrinsically intertwined. The chaos, however, is ordered and unified by a repetition of forms. The cylindrical tram, distant buildings, a zooming car and crowd of anonymous commuters are integrated harmoniously into the composition. Signed and dated l.r., red tempera "F.C.HINDER/-48".